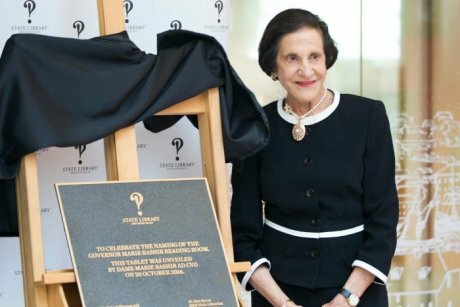 One of Australia's leading libraries has honoured one of its greatest advocates, the former governor of New South Wales Marie Bashir. The State Reference Library of NSW will now be known as the Governor Marie Bashir Reading Room. Dame Marie first visited the library as a student and went on to support it in her official capacity as governor of NSW for 13 years. After retiring from the role earlier this month, today she was back at the historic building in Sydney to unveil a plaque marking the renaming. "We wanted to publicly recognise her valuable and continuing support and affection for this great lLibrary," said state librarian Dr Alex Byrne. "The re-naming is a wonderful opportunity to recognise Dame Marie's great passion for Australian history, including her deep respect for Indigenous people and culture. "Her strong interest in the welfare of Indigenous people, our multicultural population, children and students resonates closely with the library's areas of focus." The Governor Marie Bashir Reading Room houses an extensive collection of Australian and international research material, with documentary heritage items in 42 languages and an increasing number of electronic reference resources. Every year more than 600,000 people visit the Reading Room, including local and family historians, researchers, students and the general public. Dame Marie will present the inaugural Library Honours later on Monday night.